I'm a freelance writer and student at Leeds University studying Communications. Hidden away under the financial district of Leeds is an authentic taste of Argentine culture. Welcome to Gaucho. The sophisticated and alluring lighting and decor are juxtaposed with occasional cow-hide furnishings to create an ambience like no other. 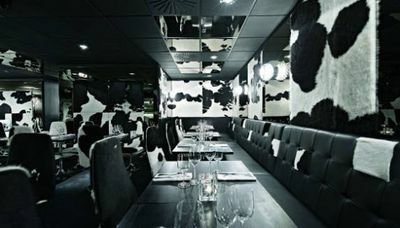 Although not to everyone's taste, this serves as a quirky touch that sets this upmarket eatery apart from the rest. The menu, although pricey, is extensive and full of choice, but it's hard to look beyond the steaks. Once you're presented with a board to display recommend the sumptuous selection of different meat cuts it is practically impossible to say no. The three of us opted for different steaks cooked to our own tastes. To start, we indulged in the Sausage Platter, a selection of Argentina's finest. The restaurant was full of enthusiastic, hungry diners so we expected the service to be fairly slow. However, moments after ordering we were presented with a delectable selection of breads, oils and vinegars to keep us interested – and how it worked. By the time we had, in all honesty, devoured our complementary entree, our sausage platter arrived. Each sausage was full of flavour and individual in texture and taste, my personal favourite being the Chorizo Picante. Safe to say, after the exquisite starter we were excited receive our main course. Our steaks were cooked to suit our individual tastes perfectly. I opted for the 400g Churrasco de Lomo, a fillet steak marinated in garlic, parsley and olive oil. Initially I was intimidated by the sheer size of it but once I began to eat my worries disintegrated. Complimented perfectly by the smoked garlic hollandaise sauce, this dish was faultless. The chips and salad were also of a very high standard and before I knew it, I had eaten the entirety of my mammoth portion, as had my fellow diners. Each of us was left completely stuffed, raving about the food we'd just eaten. Although tempted by deserts such as Argentinean Baked Alaska and Chocolate and Ginger Tart, it would have been one step too far to order a third course. Our experience at Gaucho was further improved by the impeccable service we received throughout dinner. Although the restaurant was busy, each member of staff, from the hostess to the manager, was extremely attentive to all of our requests and no question was too much to ask. For a decadent insight into high quality Argentine delicacies, look no further. Although not for those on a tight budget, Gaucho provides an exquisite evening for those willing to indulge, and I cannot wait to return.